The bathroom traps primary function is to retain water to block sewer gases from passing through the plumbing drain pipes into the air. Bathroom drains, traps, and extension tubes are 1-1/4" in diameter. 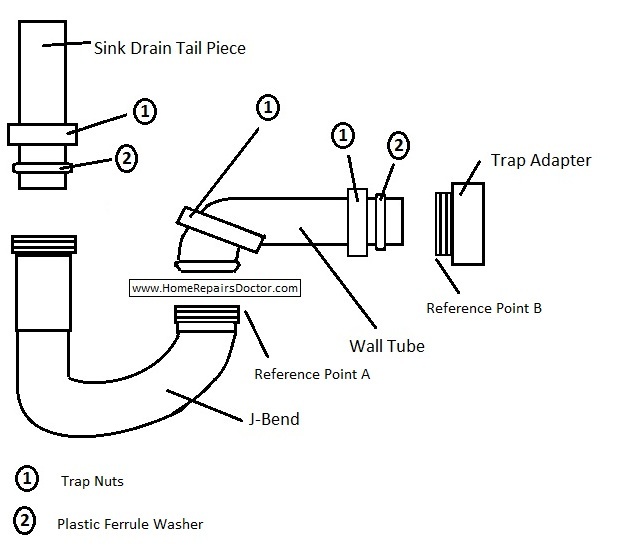 The trap adapter is the piece on the drain pipe sticking out of the wall that the trap connects to. There are two materials that bathroom traps and extension tubes are made of, these would be plastic and light gauge steel. Before removing the trap place a small bucket or equivalent under the trap to catch the water in the trap while you are removing the trap. Tools required for installing a bathroom trap is a pair of channel-lock pliers, hacksaw, and plumbers pipe dope. Traps can rotate three inches to either side to align with the trap adapter. Insert a trap nut over the sink drain tailpiece with the threads facing down, insert a plastic ferrule washer beveled edge down under the nut onto the sink tailpiece. The plastic washer will hold the trap nut in place while you install the rest of the trap. Position the j-bend tube onto the sink drain tailpiece and tighten the trap nut to the j-bend just a few turns to hold the j-bend into position while you do step 3. If step 3 is necessary, the wall tube length may not have to be adjusted. Measure the distace between reference point A and reference point B in the diagram above. Measure from the inside of the bend on the wall tube your referenced measurement plus 1 inch and make a mark onto the wall tube. Gently cut the wall tube with a hacksaw. Remove the j-bend from the sink tailpiece, apply a thin coat of pipe-dope onto the top of the j-bend where it seals against the plastic ferrule washer. Re-install the j-bend onto the sink drain tailpiece. Insert one trap nut onto the wall tube, slide the nut all the way down to the mushroomed head of the wall tube with the threads facing towards the mushroomed head. Next insert a trap nut onto the wall tube with the threads facing away from the mushroomed head, insert a plastic ferrule washer onto the wall tube beveled edge away from the trap nut. 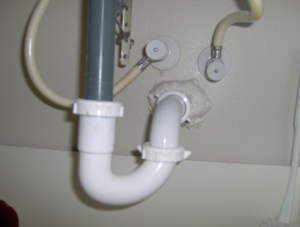 Apply a thin coat of pipe-dope over the mushroomed head where it makes the seal to the j-bend, also apply a thin coat of pipe-dope onto the trap adapter where it makes a seal to the plastic ferrule at the end of the wall tube. Insert the wall tube into the trap adapter untill the mushroomed head aligns with the j-bend, hand tighten all the trap nut's. Using channel-lock pliers turn the trap nuts another 1/8 of a turn being careful not to over tighten the trap nuts. Leave the water running while you check for a leak, run water in the sink and check around the trap for leaks. If there is a leak, tighten the nut by the leak a 1/8 to 1/4 turn. Dry the area and re-check for leaks.